Star Wars Holiday Dress Socks | Nerd Much? 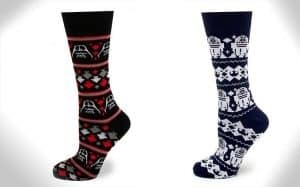 We love a good nerdy holiday mash-up, and ThinkGeek’s new Star Wars Holiday Dress Socks are yet another awesome mix of Star Wars and Christmas. There are two separate styles of Star Wars Christmas socks, an R2-D2 edition that is dark blue and white with R2-D2 and the Rebel logo all over it and a Darth Vader edition with Darth and Star Destroyers all over it. Both look fantastic, and they’re a great way to spread some nerdy holiday cheer during the holiday season. They’re also made using JuteCell yarn, which has anti-microbial properties so that your feet don’t stink as bad. Soon, we’ll be putting these dress socks on with our nerdy ugly Christmas sweaters while we sip eggnog coffee from our Star Wars Ugly Sweater Mug and watch whatever Christmas movie is on TV. They’re available now on ThinkGeek for $24.99. For more cool stuff to buy, stay tuned to Nerd Much?. You can also follow us on Twitter for more cool things.